Pokémon games have always had some form of battling within them and Pokémon GO continues this with Gym Battles. However, unlike the main games, the moves that your Pokémon have are unable to be changed, leaving you with the set moves that you have when you get the Pokémon, although some will change through evolution. Each Pokémon has two moves. One standard move and one special move. The standard move can be called upon at any time while the special move some extra time. 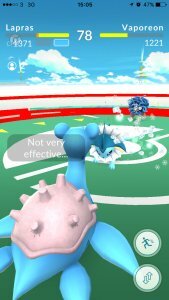 When attacking a Pokémon in a gym, an energy metre will fill up based on your hits. When a bar is filled up, you can hold down the screen to unleash the Special Attack. Each Pokémon can have one of two fast attacks and one of up to four special attacks. While these can't change, when you evolve a Pokémon the move may stay the same, or it could be re-reolled for a different move. All moves are damaging moves and none of them have any secondary effect. There is the Same Type Attack Bonus in the game of 25% if you use a move with the same type as your Pokémon.